… last heard failing to communicate effectively with a client on the phone Wednesday evening. Actually I think this is down to going out to protest in song against local cuts to services: Library and traditional folk-y protest songs on Saturday, and Blackheath Halls Dies Irae from Verdi’s Requiem on Sunday. I should have stayed in bed and nursed my sore throat, but sometimes you do for your community what you hope they would do for you, and if BHH loses it’s funding it will have more far reaching implications for my voice, and those of fifty or so others, than can be solved by antibiotics and staying in bed. I’ve been meaning to write about music and more specifically singing for some time, and a bit of enforced idleness and the prompt of not being able to rehearse the Requiem with A means that here’s the opportunity. It is a great regret to me that I don’t have a good singing voice – strong yes, tuneful, sometimes, pleasant, no. If someone turned up with a magic wand that’s what I’d wish for, a beautiful singing voice. When I was learning NLP one of the things we did was explore what our most dearly cherished but improbable ambitions were, to explore whether ‘I can’t…’ was really the case, and what would turn it into I could, I might, or even I can. I owned up to wanting to sing on stage, not a solo, just in a choir. Well, I’ve done it several times now, thanks to Raise the Roof at Horniman Museum and the Chorus at Blackheath Halls (currently threatened by Greenwich Council with having their funding withdrawn completely), we’ve sung everything from show tunes, pop standards, folk and South African Township songs, through to opera and modern choral works (even on stage at Royal Festival Hall… ) and there is nothing to beat singing in a group, whatever you are singing. The interdependence of singing in harmony; and the trust you have to have in yourself and each other is heart warming, and the sound, sometimes, when it goes really well, is heart stopping: there is an element of alchemy, of the sum being so much greater than the parts, when you can feel the different notes vibrating in the air and combining, and know it’s exactly right. When I think back to sitting in that hotel in Hammersmith coming up with my wildest dream, and not yet believing it could happen, ever, I hardly recognise the person who thought that. At the time it amused me to try out what could make me believe it was possible… it was an interesting exercise and I never thought it could be turned into reality. But now I think about what it really did for me: I used to be afraid of speaking in public (once I was talking at a huge conference and got to the contentious part of my presentation, and my voice just dried- I couldn’t say those things out loud.) Now I take it in my stride – compared to singing it’s easy – I don’t have to remember the words, I don’t have to fit in with other people and I don’t have to be in tune! Easy! And when I am singing, I don’t get stage fright, perhaps because I know my limitations, and because I know that other people will support me, I don’t feel the need for overwhelming success and consequently I’m untroubled by fear of failure. If something goes wrong, keep smiling and keep going. Mostly the audience won’t notice, they are there to have a good time and so are we. The variety and the different ways it stretches me interest me too, with RtR we do everything by ear and the process of establishing the harmonies is ‘organic’ often changing on the day of performance, encouraging flexibility, spontenaity and fearlessness; with BHH we work from scores, but for the operas we have to learn our parts by heart, remember cues, act… encouraging me to trust my memory (a challenge!) and learn with my body where to find specific notes. and when RtR isn’t meeting, over the summer, we host weekly drop in singing sessions, informal sharing of loved songs, exploring rudimentary harmonies, and discovering new shared enthusiasms- sea shanties currently! And singing is such fun… I can go to choir rehearsal feeling flat and exhausted and at the end of two hours hard physical work, bounce home the mile and a half in the dark singing the whole way. 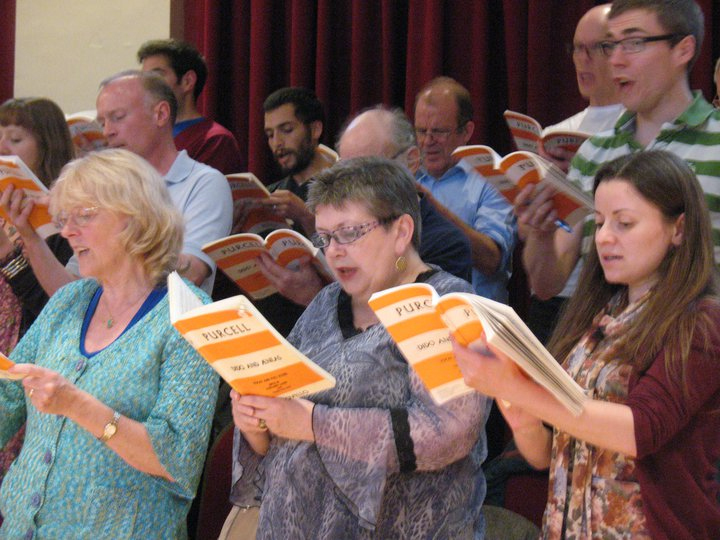 Perhaps the most important thing about being in a choir (or two) is the feeling of community and belonging, of having something worthwhile to contribute to the common wheal, that together we make something remarkable. This entry was posted in community, Happiness, music, NLP and tagged Change from Choice, Cherry Potts, confidence, happiness, Neurolinguistic programming, NLP Links. Bookmark the permalink.